You may already be familiar with LibreOffice, known for being an incredibly popular open source office application (available for Windows, Mac, and Linux). 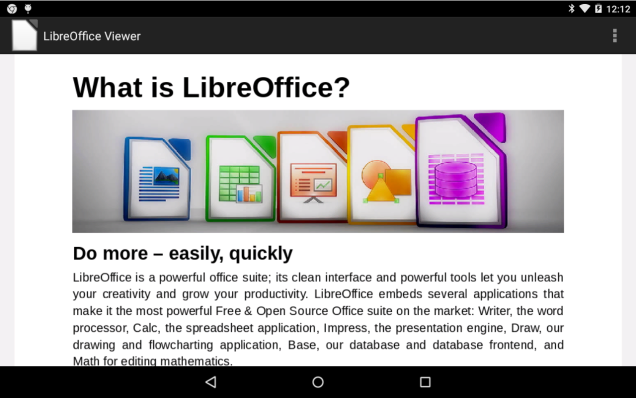 The good news, is the developers at Collabora are making the move to Android –beginning with a beta version of their LibreOffice Viewer. They warn that it’s not stable (and therefore not recommended for mission critical tasks), but they are also welcoming of all feedback and bug reports in an effort to make this app as successful as possible. Functionality is pretty basic at this point, but future releases (available weekly) promise to work with URLs and accessing external SD storage. Ready to try an alternative for reading documents on your Android devices? Download LibreOffice Viewer Beta for free now!